Just returned from a screening of Days of Heaven at a local theatre–not bad for a 28-year old film. Though advertised as a brand-spankin’ new print, I was disappointed: both the film and sound were scratchy, not to mention dark and out of focus (the film, not the sound). Didn’t matter though; I was as enraptured with it as I was the first time I saw it in Sacramento, California. 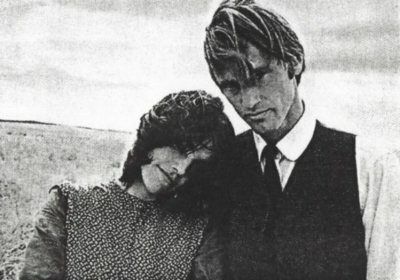 It was exactly as I remembered it: dreamlike and lyrical, with with ample close-ups of an impossibly young Sam Shepard and an even younger Richard Gere, both looking timeless despite the deeply tousled seventies hair and form-fitting trousers…. Movies–that’s what I want to talk about. Though reading made the earliest and most profound impact upon me, I’m not really effusive when it comes to books. I do have opinions (honest!) about novels, authors, the act of writing, etc., but for some reason they seem too…personal to share. As far as I’m concerned, reading is a private and complex act–what one derives from it is a unique interpretation/visualization of text which really cannot be shared by anyone else. But movies! The art of manipulating sound, images and time to give us, the viewer, a distinct view of a world which is then reinterpreted by us via our own history/acculturation, is fascinating. Filmmaking is a tight-rope act: a static amalgamation of sensory effects that wind up creating visceral responses, immediate or complex. And in certain films, these effects can be transcendent. Take for example, The Ghost and Mrs. Muir: a mid-forties film that was probably then considered a routine fantasy plot. But I find myself deeply moved each time I watch it. Why? It’s the lighting. The brightly lit cliffs when Gene Tierney arrives at the house; the complex shadows darkening her room as she slips into love with a ghost–it’s literally the manipulation of light that makes the film more than entertainment. Want more examples? Rent The Wind and watch Lillian Gish’s face contort as her efforts to bury the man who attacked her are undone by unceasing wind. Or the look in Peter Lorre‘s eyes in M, as he tries and fails to explain why he kills children. Little moments that take my breath away each time I watch. Okay; I’ll stop. Next time I’ll discuss the future of bling as portrayed in the Kanye West/Pharrell video team-up….